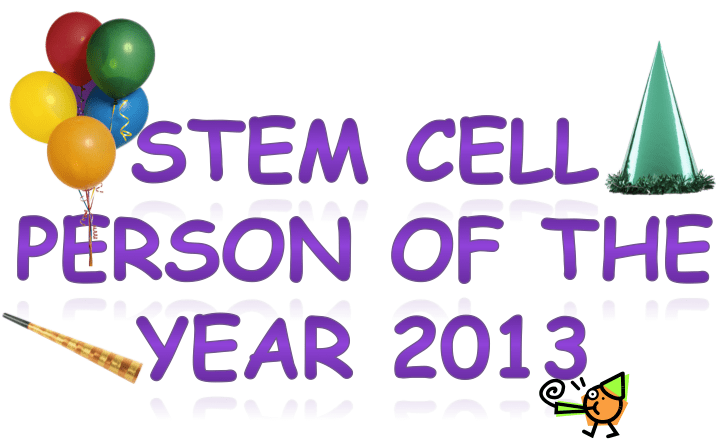 The 2013 Stem Cell Person of the Year Award process (see details and rules here) is off to a great start. With about a week remaining in the time period for nominations I have 2 dozen nominees so far. This group of nominees is very diverse, far more so than last year, and includes more scientists and physicians. A very interesting development. I will announce the nominees next week after the September 30th deadline. Things are going to be a little bit different in terms of what happens next compared to last year. This year for the 2013 Award we will have an online vote to choose the semi-finalists from the nominees, while last year I chose the semifinalists. There is still time to nominate people so please let me know your thoughts and then vote next week on your favorite to be a semi-finalist. Roughly the top 10-16 vote getters will move on to be semi-finalists.